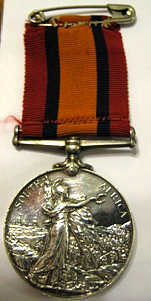 Pictures of the Queens South Africa Medal, which was issued to Nursing Sister L Ainsworth. Princess Christian's Army Nursing Reserve. 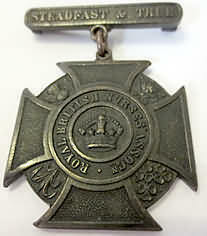 Lilian joined Princess Christian's Army Nursing Reserve on February 4th 1898, and her Number was 83, (1) so she too would have worn the beautiful cape badge (see fig.5) of the Princess Christian's Army Nursing Reserve. · No. 8 Stationary Hospital, Port Elizabeth. Lilians World War 1 records survived the cull in the 1930's of nurses records. Having passed her medical in Chelsea on May Day 1915, and signed her war department contract five days later, she joined Queen Alexandra's Imperial Military Nursing Service Reserve -aged 43 years. (Men over 40 were initially exempt from active service, although some, like my Great Grandfather insisted on going: he was subsequently killed in Passchendaele). Lilian was initially sent to work as a sister in Sidney Hall, Military Hospital, Weymouth. ON 19th July 1915, she was transferred to Egypt, where she appears to work for one year. She embarked in Suez on 16th may 1916, Disembarking in Basra after a voyage of 25 days, joining the British General Hospital for duty on 17th June 1916. Within two months, Lilian was admitted to hospital with sandfly fever and was invalided to India on H.S. Donogola, authorised by the Matron in Chief. SANDFLY FEVER - Sandfly fever was a persistant problem during World War 1 in the Eastern Campaign area, having been endemic in the lowland areas of tropical and subtropical countries. The female midge Phlebotomus Papataci (which translates from Italian to sandfly) transfers it. A few days after the initial bite, symptoms appear, including fever, malaise, headaches, muscle and joint pain, facial flushing and tachycardia. After a few days, the pyrexia subsides, and residual problems, which can remain for up to a few weeks, include; fatigue, hypotension and bradycardia. Complete recovery is the norm. On 29th January 1918, Lilian was admitted to No 1 B.G.H, being transferred to the Officers Hospital on 30th March 1918 and invalided to Indian Ambulance Ship Varela, with dysentery. Signed F.S.Maude, Lt general, Commanding -in -Chief, Mesopotamian Expeditionary force. It is unclear whether Lilian did receive a pension, and aged 48 years is no longer well enough to work. "This was designed by H.R.H. Princess Christian who gave it her father’s motto ‘Steadfast and True’. Shortly before her death in 1923, H.R.H. Princess Christian told an officer of the RBNA ‘I have loved the Association and I gave it my father’s motto’. Dr and Mrs Bedford Fenwick founded this in 1887. They along with several Doctors and Matrons were interested in founding a nurse's version of the British Medical Association. A council was created, and constitution drafted. Along with Matrons and nurses, doctors were also members. Its seems very male dominated, and to us now strange that male doctors men should have been included onto the Council , and had a large part in the new association. In 1890, the female vote was a long way off being achieved; the National Suffrage movement had been established in 1872, but did not take off until the early 20th century. 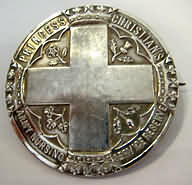 Princess Christian was the president of the first nurses association in the world. Many members were mainly from the Middlesex and St Bartholomew's, other London teaching hospitals being rarely represented. There was much opposition, not just among other nursing pioneers such as Florence Nightingale and Eva Luckes, but also the Nursing press. In 1898 The Nursing Record and Hospital World is very scathing about this by now 10-year-old association (3) and suggests that Lilian, whose name as Honorary Officer along with several others, was withheld by their own wish! (Which the press subsequently published). A charter was granted in 1893, which was followed by a Royal Charter. Many were vociferous in their support against nurses registration, - a cause which united Eva Luckes and Florence Nightingale. Eventually an act of Parliament was passed in 1919, leading to the first registrations in 1921- the first being Mrs Bedford Fenwick. 7. The National Archives, Kew, QSA Medal Roll WO 100/229, pg's 55, 62, 95. 11. http://rcnarchive.rcn.org.uk/ The British Journal of Nursing/ Volume 70, June 2nd 1923 pg 347. Sketches 1914-1919.Hodgins, Matron F.M. Nursing in Mesopotamia, 1916-1918 London: John Bale. 28-33. With many thanks to all those people, who answered my many email questions, and in particular: Will Burgess, Webmaster@schoolsofnursing.co.uk for proof reading, editing, encouragement; Keiron@Boerwarnurses.com and lastly but not least my very supportive husband, Harry.